It seems like we wouldn't have to wait a full week to see the full-length Mockingjay Part 1 trailer after all, contrary to what was initially stated. However, although @VolgaFilm is the official Russian distributor of The Hunger Games films, please consider this unconfirmed until we hear an official word from Lionsgate. If you haven't seen the two teaser trailers for Mockingjay Part 1 click HERE and HERE. SANTA MONICA, Calif. and DALLAS, July 18, 2014 /CNW/ -- Lionsgate (NYSE: LGF), a premier next generation global content leader, and Samsung Telecommunications America, LLC (Samsung), have teamed up on the next installment of the global blockbuster Hunger Games franchise, The Hunger Games: Mockingjay – Part 1. The collaboration will launch with all fans getting a sneak peek of the film's first official teaser trailer, The Hunger Games: Mockingjay – Part 1, exclusively on Samsung's new Galaxy Tab® S ahead of its online release. In a first-of-its-kind experience, fans will have the opportunity to preview the highly-anticipated The Hunger Games: Mockingjay – Part 1 trailer on the Galaxy Tab S at an exclusive premiere in San Diego during Comic-Con on Friday, July 25. [...] "We're giving our consumers the unique experience to premiere the official trailer of The Hunger Games: Mockingjay – Part I on our new Galaxy Tab S," said Todd Pendleton, Chief Marketing Officer, Samsung Telecommunications America. "Together with Lionsgate, we will give Samsung Galaxy owners access to experience The Hunger Games franchise like never before." Unfortunately, the trailer will not be released online until early the following week, but US fans can also see the trailer on that weekend at select Best Buy Stores. UPDATE: Here's the confirmed cast members who will be in attendance for the introduction of the Full-Length Mockingjay Part 1 Trailer. 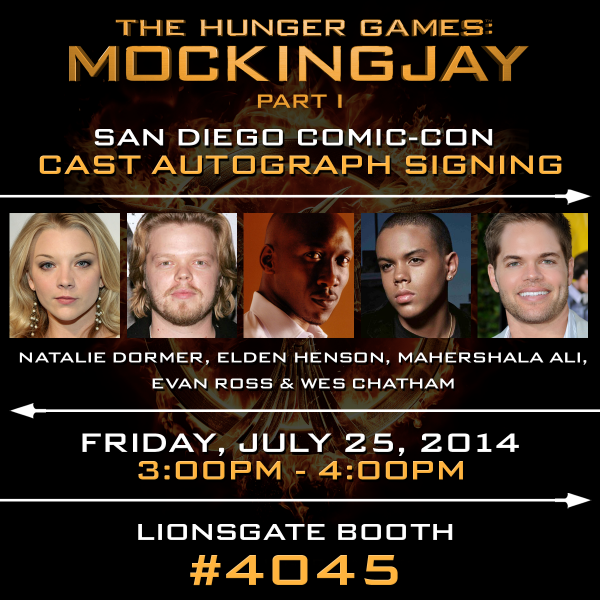 They will be signing autographs for fans on Friday, 7/25, 3pm - 4pm at Lionsgate Booth 4045. What do you think Hunger Games fans? How excited are you to see what we all assume to be the Full-Length Trailer for The Hunger Games: Mockingjay Part 1?